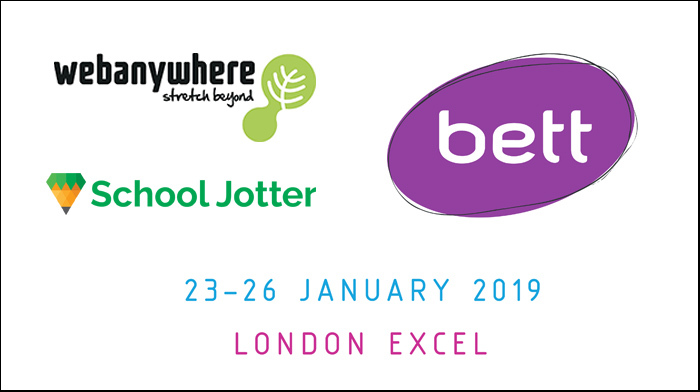 Webanywhere, a leading school website design, mobile app and software provider, today announced its participation in Bett 2019, one of the leading annual trade shows in the United Kingdom marketing information technology in education. This four day event will be held on 23-26 January 2019 at the ExCel Convention Centre in London, UK. Webanywhere will have some of their e-learning and website professionals at the conference. Their attendance at Bett underscores their dedication to helping primary and secondary schools, as well as Multi Academy Trusts, to improve both teaching and learning. Exhibiting this year at booth G249, Webanywhere will present its expanding portfolio of school websites, mobile apps and education modules. They will also demonstrate their latest product, School Bookings which enable parents to easily schedule appointments with schools online for events like parents’ evenings. Webanywhere representatives will be available at the booth for enquiries and in-booth demos throughout the event. An appointment can be made in advance by visiting this page. Webanywhere will be giving away a drone video to a lucky school too. Nearly 35,000 attendees from the global education community will be in attendance, making Bett a prime networking opportunity for education professionals looking to connect with like-minded peers. School Web Design in the U.S.
Is your school website up to Ofsted standards?